Its that time of year again. I put an insane amount of miles on my new 575 last season. 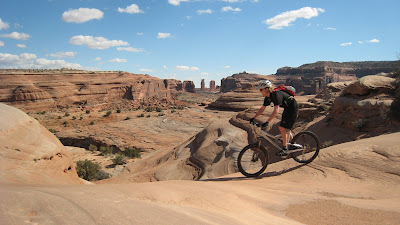 Two weeks in Idaho, almost a month in Moab and Fruita (two trips), Durango, Sedona, plus riding everyday in Jackson, eight weekends in Helena, tons at the caverns, and lots of other places including back home in Bozeman. Its safe to say my bike got worked. I'm in the process of tearing the whole bike apart and rebuilding, lubing, servicing, and re-torquing everything. This includes rebuilding the pedals, new suspension bearings, new seals for the air shock (RP23), servicing the hubs, truing the wheels, new cables and housing, new chainrings, new bling cassette (Sram 990), chain, relubing the bottombracket, flushing and relubing the headset bearings, and lots more that I can't think of right now. I'm also doing it all myself.....except for my Fox Float RLC which I'm sending off to Push Industries. They are going to service the fork and install a high volume kit to get full travel out of the fork along with a more linear feel. I can't seem to get full travel out of the fork even after removing all the air, but this is the ticket I guess. I love cracking a beer and working on the bike. She's going to be better than new soon.